192.168.2.1 is a private IPV4 address from the block of private addresses within Class C. Along with 192.168.0.1, 192.168.1.1, 10.0.0.1, and a few others, this address is one of the most popular default gateway IP addresses. Many router and modem manufacturers assign this exact address to their devices (practically all Belkin and SMC routers and modems use this address as a default gateway, many routers made by Edimax, US Robotics, Tenda, Microsoft, Airlink, etc.). If the address from the title is your router’s default gateway, you can use it to enter router’s configuration page and configure many aspects of your wi-fi network. If you are using Belkin, SMC, or Edimax router/modem, there’s a great chance that your router’s default gateway is 192.168.2.1. If you want to check your router’s default gateway, there’s a simple procedure that takes only 5 seconds. You can read about it here. If you know that 192.168.2.1 is, in fact, the default gateway, you can use it to access router’s configuration page. We will show you how to do that on a Belkin router. The procedure is pretty much the same for any modem or router. 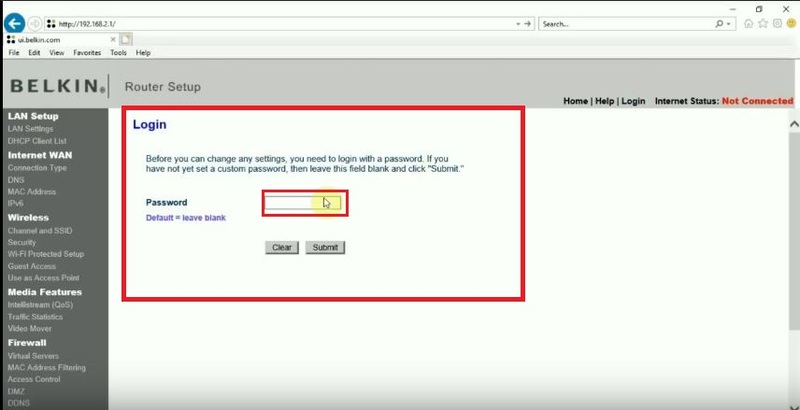 Step 2 – The login page will appear and you will have to enter the correct username and password and click submit/ login. In our case, the default username and password are blank fields but it doesn’t have to be like that for your router (it can be admin for both fields or something else). If you don’t know your router’s username and password, check out this article. Step 3 – Router’s configuration panel will appear. You will see the Status page and bunch of tabs on the left side (our example). If you have some other router, the tabs can be located on the top or on the right side of the screen. 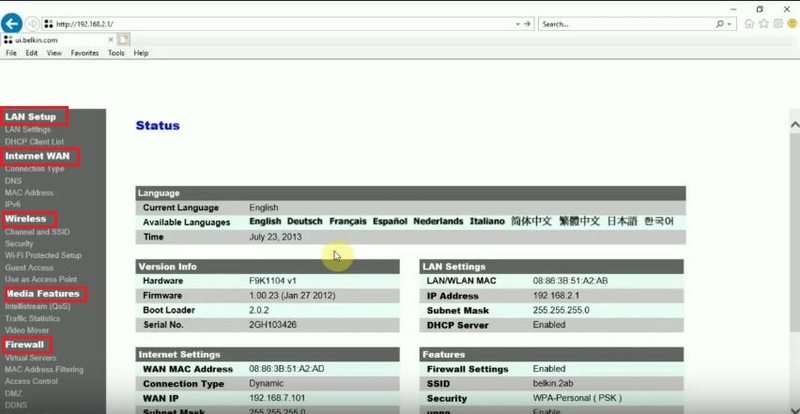 You will see the LAN Setup tab, Internet WAN tab, Wireless tab, Firewall tab, and Media Features tab. 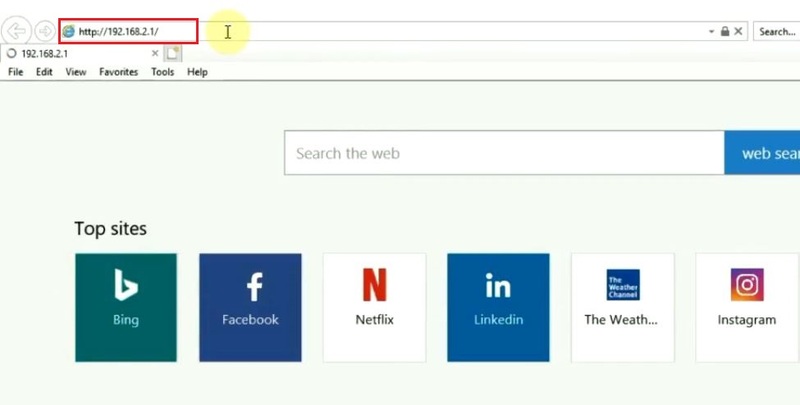 You can use these tabs to adjust all kinds ofnetwork settings. 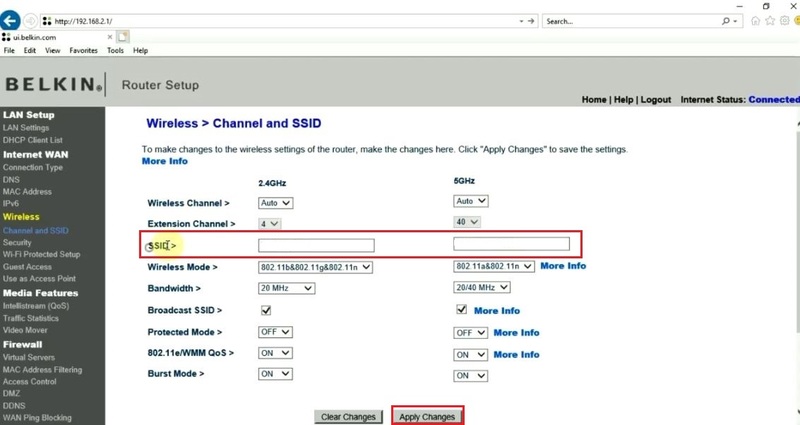 Step 4 – One of the most important things you have to do when entering this page for the first time is to configure your wi-fi network (set your network name (SSID) and change the Wi-Fi password). In order to set the name, go to Wireless tab, and then click on SSID. In our case, there are 2 SSID fields since this is a dual-band router but it doesn’t have to look like this for you. You might see only one field (single-band 2.4GHz router). You will have to erase the default network name and enter the name you like. After that, click on Apply Changes (or maybe Save in your case). Step 5 – In order to change your wi-fi password, go to the next section in the wireless tab (security). 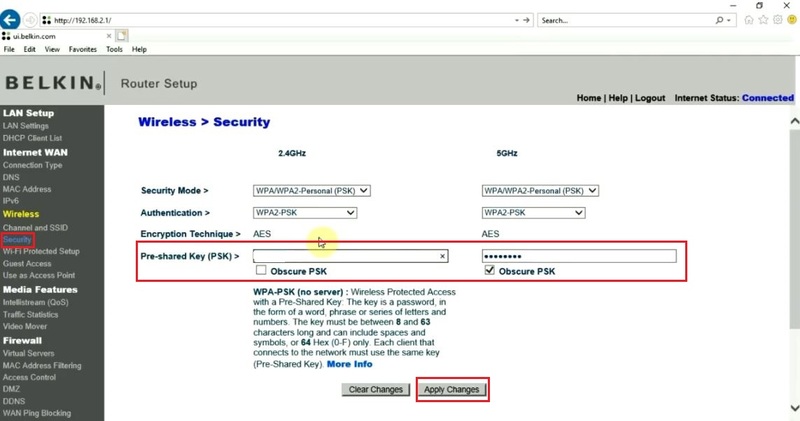 Choose WPA2/PSK and enter your password. In our case, there are two fields but if you have a single-band router, you will see only one field. Enter the password and click on Apply Changes/Save. I just changed my password on my hotspot. I have problem with wpa2 and no way it will not connect and says authentication. Can WPA2-PSK be used to improve your Wi-Fi security? How can I access my home router? If you want to acces your router’s configuration page http://192.168.2.1/ you must to connect it directly to your computer with ethernet cable. Can someone help me here with my new belkin f9k1106v1 router which the service engineer fixed up for me. I need help with setup. I don’t know also what is my password. I have a problem with “Step 3”.